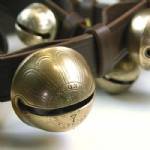 This dark-brown neck strap features a set of 18 petal bells from the early 1800s. The handsome bells on this strap were cast by a Who's-Who list of famous American sleigh-bell foundries, including William Barton (WB), Parsons & Smith, and Vine B. Starr (VS) of East Hampton, Connecticut, and Joseph Shipman (JS) of New Britain, Connecticut. The strap, about 65 inches long from buckle to buckle, is sized to fit on a typical draft horse collar. The strap is 1 1/2" wide overall, but tapers slightly to 1 1/4" at the very ends to fit the new solid-brass buckles. A separate billet (short strap with holes, not shown) is fastened onto the two buckles to complete the piece. The bell strap can be adjusted to fit different horses by buckling in a billet of the correct length. "Keeper loops" between each pair of bells hold the bell strap and lining strap together.